Many mandolinists have taken that path of branching out from months or years of playing guitar to our small 8-string wonder. Whether they are driven from (in the case of a frustrated guitarist) or drawn to, the mandolin offers a whole new world of sonority, expression, and challenges. We want to explore some important concepts for those pondering that move. First thing to remember: It's not a little guitar. Despite the similarities, strings, frets, pick, wood, etc, the mandolin is really an instrument of its own. The size and tuning are the most obvious difference, but there is a common misconception in how small hands have to be to play the mandolin. While a guitar player is used to chromatic one finger-one fret in most playing, the mandolinist (like the violinist) skips a 1/2 step and for the most part things of the instrument diatonically. In other words, one note per note of the scale, occasionally 1/2 steps but mostly two frets at a time per finger. Fingers spread from 1st to 4th fret will stretch 5-1/8", at the most on a guitar. On a mandolin that same index to pinky stretch at the most is 4-5/8", 1st fret to 7th. It should make you chuckle when a guitar player bemoans, "I could never play the mandolin; my fingers are too big." 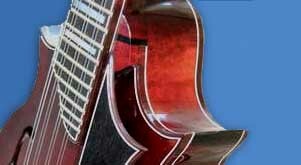 It's critical to understand the three things a mandolin does well in departing from the "little guitar" approach: tremolo, soprano melody, and cross picking. Yes, you can do the clacky, clacky accompaniment chord thing, but we'll explain in a moment the dangers in making this your only skill. Tremolo. The double course and lighter gauge mandolin strings make a tremolo work far better than you could dream. Even Django Rheinhardt was teased about making his instrument sound mandolin-like. It's associated with it in Europe literally for centuries. This is an effect to exploit, so take the time to master it. Soprano Melody. When the rest of the band plays lightly and the mandolin is exposed playing the melody, the angels sing. That lighter timbre is a welcome contrast from the heavier instruments. You need to master a smooth sense line, notes bleeding from one to the next. Connect, connect, connect, all the time. Shorter strings decay quicker so you need a good articulation with the pick and an even more secure left hand grip in between the frets. Cross picking. You won't have the multiple finger pick attack of the banjo, but that piercing flow of notes isn't always what the audience wants to hear. The mandolin allows a subtle subdivision that lends the ensemble energy without being overbearing. Good cross-picking technique is well worth the investment of time. We mentioned the "clacky, clacky" chording thing. It's not horrible when the mandolin is solo, although without the lower tenor register, the mandolin makes for a tepid accompaniment instrument. It's okay for variety sake, but after several songs, the ear wants to hear some bass. Worse, when you have mandolin and guitar playing clacky chords together, they have to be impeccably in sync or it sounds awful. Bad news too--the mandolin gets blamed no matter who is off. The audience hears rhythmic irregularity, and ultimately, the higher instrument gets the blame. You are far better off lending the band the simplified back beat "chop" of a steady, metronomic pulse. It's great if you can do mandolin and guitar. Not everyone can handle the multi-instrumentalist switching back and forth thing, and it's not uncommon to see a mandolinist completely give up the guitar. One direction you can go to avoid confusion is to pick up a tenor guitar which is tuned CGDA like a mandola, or sometimes like an octave mandolin GDAE. Same with a tenor banjo, but we'll leave that for another time. Line, Please? The importance of sustain.